We are an Australian Based startup trying to enhance safety for night runners. The product called is Nightro Athletic. Nightro Athletic uses conductive fabric to power wearable LED lights. 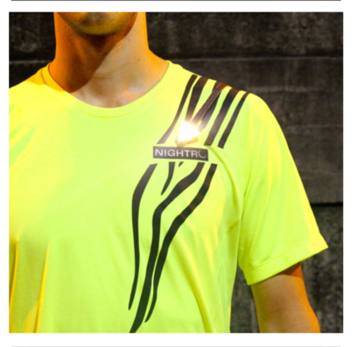 The lightweight LEDs are attached to a stand-out reflective t-shirt, enhancing both visibility and style. Our Kickstarter campaign runs until the 18th December. Why did you make the Nightro Athletic line? We aim to make running and cycling safer at night. We spoke to runners and cyclists about the missing elements in Hi-Viz activewear. There was a common theme with their responses – uncomfortable, unsafe and unfashionable. Statistics released by the Australian Road Deaths Database reveal that 70 pedestrian fatalities were recorded nationwide in 2013 as a result of road crashes after 6pm. Additionally, Runners World released an article recently in conjunction with RunKeeper. They found most runners actually run at night both during the week and on weekends. There is currently a surplus of Hi-Viz over-vests on the market which are more suitable for a construction site rather than exercising at night. We separated ourselves from this segment as we offer a high performance running t-shirt with LED light and a reflective pattern, allowing exercise to happen at night without uncomfortable layers. Additionally, Hi-Viz products rely on the headlights of oncoming traffic to be seen. Once you wear a Nightro, the front and back flashing LED lights have you covered regardless of external factors. Nightro Athletic was born out of frustration with the existing Hi-Viz market for exercising at night. My co-founder and long time friend Ari Segal started a half marathon training regime in 2013. While running at night was most practical to suit his busy work schedule existing reflective activewear on the market failed to be both a safeguard and fashionable. Knowing that I was also a runner and engineer, Ari came to me with the idea to create our own product for exercising at night. Founder: Ryan Savitz. Biomedical engineer in the medical device industry. Runner. Founder: Ari Segal. Marketing executive in the fast moving consumer goods industry. Half marathon runner. Passionate runner. Both founders have been long time friends. We aim to reach our funding goal on Kickstarter of $40,000. After that,We plan on expanding our range to include other styles of activewear (T-shirts, Leggings, shorts) incorporating the reflective and LED technology. We also looking to incorporate more advanced wearable technology in to the T-shirt, an activity tracker to measure your heart rate as well as other fitness activities.